Yesterday, I ran my first session of Complex 214, using the classic mission Stealth Train as my guinea pig. I ran the session with three players, one of them playing their first ever roleplaying adventure. In many ways, having the chance to run the game with a mixed group of players allowed me to get a better perspective. As it happens, I don’t think there’s anything fundamentally broken or wrong. Of course, I can’t make sweeping statements after a single session. Especially not this session. The players had a lot of luck going their way. At the heart of Complex 214, challenges require a 7 to achieve a success. One player rolled three 7s in a row. That’s a 1 in 216 chance. What chance did I stand against such lucky dice throwing? It certainly made for a smooth start to the mission – and it meant that the player could comfortably get away with using their questionable abilities without a chance of recrimination. It did give me a chance to see whether the basic setup worked or not. All players start the game with three points in Access and Power. Power refers to their own personal abilities, while Access links to their sway in the wider world. By the end of the session, given that I had handed out three rewards for quick wits and amusing play, two players had 3/2 and one had 5/3. The combination of strong early success and my not pushing the challenges too hard might well suggest that the initial pools are about right. Again, only continued play and testing will really tell. Explaining the basics of the game allowed me to engage in some background, as well as mechanical details. I explained that the people of Complex 214 lived and worked for the good of the community. Everyone worked hard, born from vats to carefully balanced and purified genetic templates. Everyone worked for the common cause, and all used the skills and expertise they acquired from training and evening edutainment for the good of the Complex. Genetic perfection meant no risk of impurity – so, no mutations, obviously. Hard work and striving for a common good meant no doubts or subversion – so, no splinter groups or secret plots. Constant focus and common goals in an ideal society meant no need to pursue personal agendas – so, no using skills or expertise for questionable or perfidious ends. All characters starts with a Mutation, a Secret Affiliation, and Unethical Ends card. Each card outlines the purpose to which these facets can be put to work in play, to assist in completing tasks. They offer an adjustment of 1 – mechanically allowing a success on a 6, 7 or 8. You need to decide to use a card before you roll. After you roll, your team mates have the option to help you get a success if you didn’t roll one to begin with. In this session, for those first three rolls, that didn’t come into play. If it had, the team mate has the option to help with Access or Power. Where a team mate chooses to spend points, they can opt for a Selfless Success, a Selfish Success, or acquire Incriminating Evidence if they challenged player used a card. In all circumstances, it’s still a success. For this session, the players stuck to helping one another. With a new player, that seemed like the fairest course of action. However, one player did note that he liked the potential he saw for this mechanic to screw people around. If you opt for Incriminating Evidence, the player places a black token next to their character card. Depending on how many they have at the end of the game compared to their Access pool determines what fate has in store at the debriefing. The players enjoyed the session, especially as they quickly noticed I took their suggestions or groans of despair and worked them into the session. If they thought something might happen, it did. So, when they hit a button to call a lift and joked that it would probably set off a klaxon and a warning, it did. An automated voice warned them ‘Not to touch this button again’ amidst an ear-splitting warning wail – certain to be heard by anyone else nearby. When they travelled down in the lift, it made a lot of noise, like the mechanism might break at any moment. When they reached them bottom, it came with sighs of relief. Next time they heard the mechanism, they had visitors and it didn’t go well. Groans of dismay followed whenever the mechanism wheezed and crunched into activity. It actually always happened as the team planned for the next course of action, the sound cutting off one specific player mid-sentenced. It worked fantastically well to ramp up their paranoia and frustration as the situation spiralled out of their control just when they thought they had it in hand. My next key job is to get the cards for Mutations, Secret Affiliations, and Unethical Ends sorted. 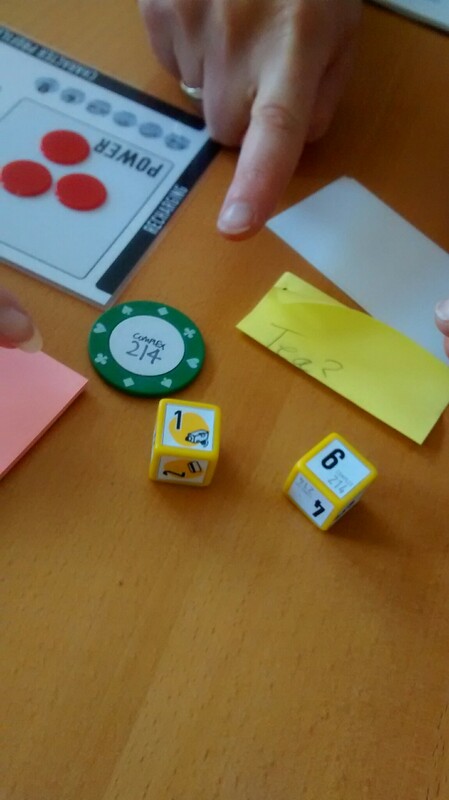 For this session, I had just enough to give three players a choice – four of each. I want to have enough to open up character generation considerably and support some really great variations in character. Each card needs to be flavourful, offer a very brief explanation, then outline three example facets of the trait. That should mean that any player can pick them up and get a fair idea of their purpose without too many questions. [Dust Pan Games] An alternative chart of D100 Mutations.